Time is all around us and accessible in the most unexpected of places. Most of us check our smartphones when we need to know what time it is, and that’s only if our smartphone calendars don’t remind us where we need to be throughout the day. Then there are all the electronics and appliances in our homes displaying the time in one way or another. Yet there’s something special about a good, old-fashioned wall clock — not just any wall clock, but one that doubles as a functional object to keep us on track while serving as a statement piece or even a work of art. Hanging a modern wall clock adds a sense of sophistication to the room. If you’re looking to add a fun and functional design element, we’ve put together a collection of the top choices available online. Here are Freshome’s picks for the best modern wall clocks. This Dutch-made clock ($149) is made of recycled felt. Its striking gray fuzzy face is molded and stamped into shape to create this simple yet bold design, whose orange hands add a welcome pop of color. The Hazy 35 Clock ($199) is another modern wall clock by Dutch design firm LEFF Amsterdam that made it onto our list. Its unconventional look is inspired by a blurry perspective that tells you what time it is while still looking like a ghost on the wall. The hands of the Manifold clock ($76) are made of plexi sheeting and move in a 3D pattern that changes form constantly. Mesmerizing in its effect and variation of color, the Manifold clock is more than just a timepiece — it’s a Zen gazing object. The Ribbonwood clock ($60) by Michelle Ivankovic is the winner of the retailer’s 2014 Umbra/Humber Student Design Competition, and for good reason. Natural ribbons of bent beech wood update the clock’s nod to mid-century modern design and elevate it into something that’s very 21st century. Mercury Row takes the hot art trend of retro-starburst patterns and converts it cleverly into this Metal Wall Clock ($35). CB2 perfectly describes its Copper Wall Clock ($50) as “ahead of its time.” The rose gold finish is on top of the home design trends for 2016, and this is an easy way to mix it in with the metal finishes already in your home. 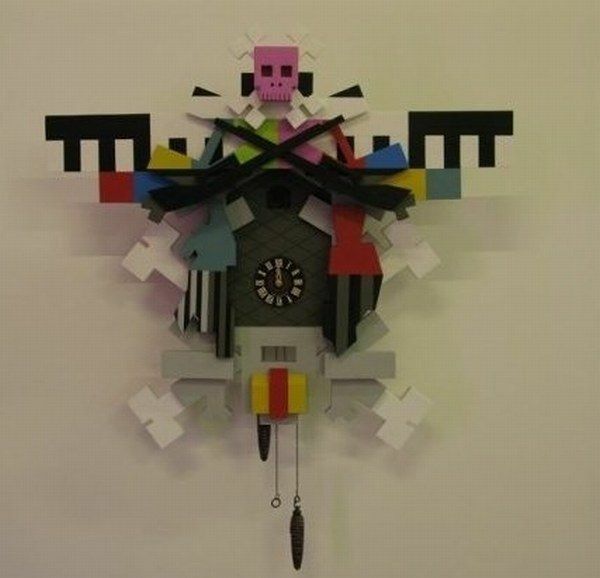 When a dose of pop art is a must in a room, the Watch Me Wall Clock ($50) is the perfect candidate. It’s available in your choice of four color ranges; perhaps a Watch Me gallery wall is in order! All of these modern wall clocks are lightweight, easy to hang and battery powered. You can move them from room to room as the whim strikes, or continue to add new ones to your collection.